In two weeks, educators from around the state will gather at Indiana State University to refresh and enrich their teaching. The 16th annual event will take place on Nov. 3 from 8 a.m. to 3 p.m. The professional development conference will take place at University Hall on the campus of ISU, offering a variety of informational sessions and featuring a theme of "Technology: Essential Tools for Student Success." Teachers will be introduced to innovative ways of using emerging tools to support student learning, said Denise Collins, associate dean for academic and student affairs at the ISU Bayh College of Education and coordinator for this year's event. "The conference focuses on issues of immediate value to classroom practice and allows educators to put ideas into practice instantly," said Collins. She said the event, which will host more than 150 educators, provides attendees an opportunity to "rejuvenate and refresh," as well as network with other teachers and administrative professionals. "Camaraderie, professional inspiration and renewed sense of purpose are some of the things we hope people gain as a result of attending Sycamore Educators Day," said Collins. The conference will feature keynote speakers Eric Sheninger and Todd Whitaker. Sheninger, principal of New Milford High School in New Jersey and a leader in the field of education, will discuss effective ways to use technology and social media in an educational setting. These are powerful tools that can be used to "engage students, improve communications with stakeholders, and help educators grow professionally," Sheninger said on his website. He has co-authored two books, writes on education for the Huffington Post, serves on the board of Foundation for Educational Administration and has received a number of awards, including Google Certified Teacher and Adobe Education Leader. "Eric Scheninger is an inspirational principal who is passionate about fostering learning environments that are student-centered, collaborative, flexible and prepare all learners to succeed in the 21st Century," said Brad Balch, dean of the ISU Bayh College of Education. Whitaker, professor of leadership education at ISU and "leading presenter" in the field of education will be the second keynote speaker for the event. He has written 24 books, including bestseller "What Great Teachers Do Differently." Whitaker's presentation this year is titled "The Magic Bean." "There seem to be an endless amount of magic solutions to improving education and schools today. Whether it is pay-for-performance, charter schools, expanded school days, new teacher evaluations or a myriad of programs with alphabetic acronyms, it seems as though ‘this' is the answer we have all been searching for, or at least that is what we are being told," said Whitaker. In his session, he plans to analyze and identify the "magic bean" being sought after in the field of education. Balch said he hopes educators will take advantage of the engaging and informational day's events. "Sycamore Educators Day is a great opportunity for professional development and renewal for teachers," he said. 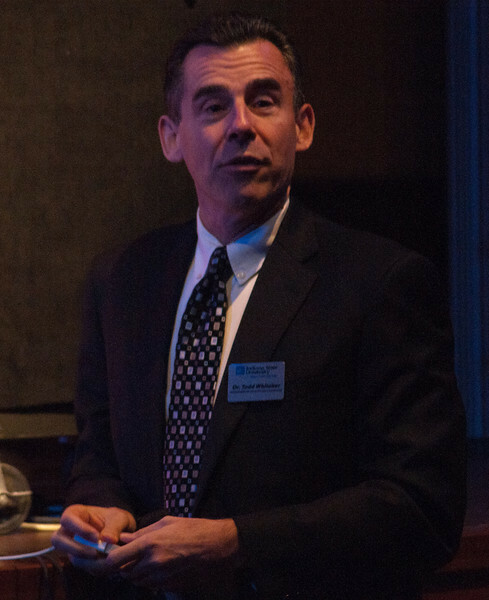 Todd Whitaker speaking at the 2011 Sycamore Educators Day. The 16th annual professional development conference will take place on Nov. 3 from 8 a.m. to 3 p.m.